The Yaesu FT-8900E is a mobile quad band transceiver, high quality, covering in FM analog mode only, the bands 29, 50, 144 and 430 MHz. It includes cross-band capabilities and full duplex VHF-UHF, double reception, 799 memory channels, 50 watts VHF and 35 watts UHF. 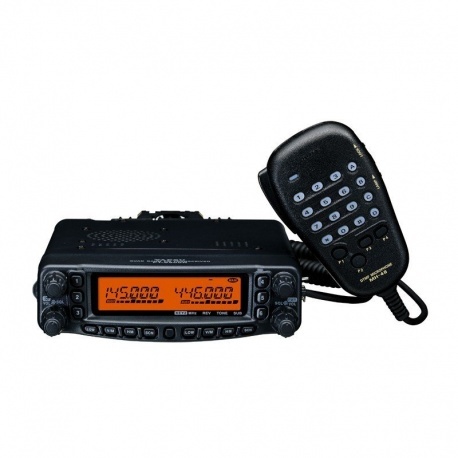 2 VFO's completely independent, the Yaesu FT-8900E can be configured in different ways. For example, you can set the "left" side of the transceiver to traffic on 29, 50, 144 or 430 MHz, while having the "right" side, either 144 MHz or 430 MHz. The left and right side have their own S-Meter, volume button and VFO to change frequencies or channels, ideal transceiver for the amateur radio satellite trafic or DX FM. Comes with: Yaesu Mobile FT8900E, DTMF hand microphone, 12V power cable, car bracket, display expansion kit, instructions in english. Description: The Yaesu FT-8900E is a mobile quad band transceiver , high quality, covering in FM analog mode only, the bands 29, 50, 144 and 430 MHz . It includes cross-band capabilities and full duplex VHF-UHF, double reception, 799 memory channels, 50 watts VHF and 35 watts UHF . 2 VFO's completely independent, the Yaesu FT-8900E can be configured in different ways. For example, you can set the "left" side of the transceiver to traffic on 29, 50, 144 or 430 MHz, while having the "right" side, either 144 MHz or 430 MHz. The left and right side have their own S-Meter, volume button and VFO to change frequencies or channels, ideal transceiver for the amateur radio satellite trafic or DX FM. Comes with: Yaesu Mobile FT8900E, DTMF hand microphone, 12V power cable, car bracket, display expansion kit, instructions in english.